All hail the Charles Ives commemorative stamp! 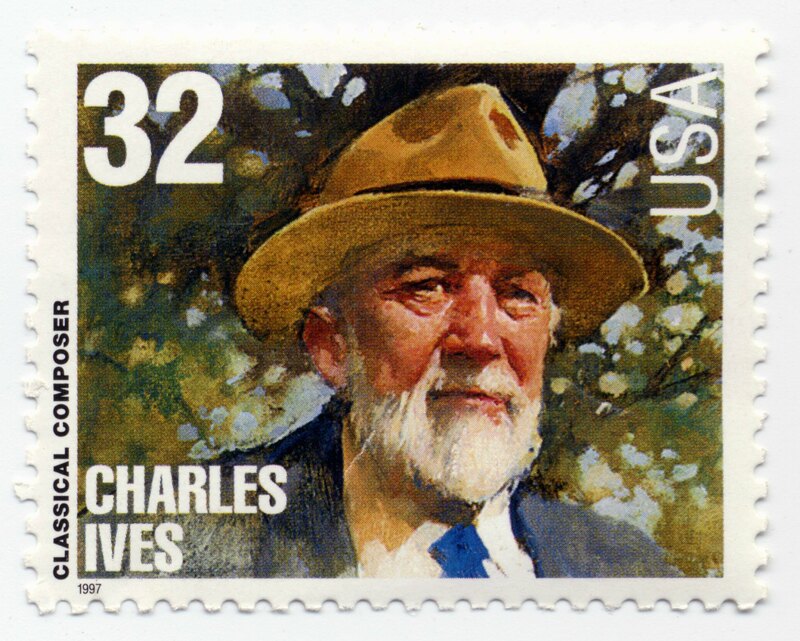 Study the life of Charles Ives. Learn about his father’s musical experiments and ear training exercises. George Edward Ives (Charles’ father) would tune a piano a quarter tone off-key for playing duets with a “properly” tuned piano. He’d make young Charlie sing a song in one key while playing it in another. He marched brass bands towards each other while they were playing different songs in different keys and different meters. From a distance, Young Charlie observed and listened. One day, I decided to recreate Ives’s father’s experiments. I set up two boom boxes on opposite sides of a large room, and blasted recordings of two contrasting Sousa marches simultaneously. Try it! Walk around and explore that world of clashing dissonance. Enjoy the synchronous moments that sound like the two bands are musically responding to each other. Eventually, this experiment became an annual event in my Music Studies for Dancers seminar at the Juilliard School. I’ll never forget the expression of pure ecstasy on one Juilliard dancer’s face as he found that sweet spot midway between the two stereos. Oh, the bliss of those disparate sound waves colliding upon you with ineffable synergy! Unfortunately, everything was coming out of the same lousy built-in Macbook speakers. (Because these speakers lack bass, volume, and spatial distance, internal speakers severely reduce the inherent antiphonal, polymetric potential of this musical collision). Nevertheless, the effect was powerful enough to made me wonder. . .
What if George Edward Ives had lived in the late 20th century and had liked heavy metal?. . . Instead of two brass bands, what if he had employed Tool and Metallica in his experiments? Run and get yourself two equally loud audio systems and a room big enough to handle them. Then, go nuts with this idea and share what you learn. Apply what you discover.